2008- Canadian Aboriginal Music Award- Special Jury Prize for Mr. Ruddell’s career and ongoing work with First Nations’ music projects in Canada and the United States. 2013- Rock Music For The Erratics– electroacoustic score commissioned for visual artist Jean Wellburn’s installation at The Stationhouse Gallery in Williams Lake, B.C.-40 mins. 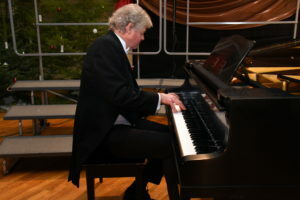 2011-New Journeys– CD and performance project with Terri-Lynn Williams-Davidson-soloist. Percussion, Cello, Acoustic and electric guitars, Keyboard. Conducted by Bruce Ruddell- Museum of Anthropology, Vancouver BC, The Friendship Centre, Skidegate, BC, Headline concert on the Victoria legislature lawn-July 1st 2012 celebrations-42 mins. 2009- Vigil– performed by the Borealis String Quartet and The Christ Church Cathedral choir, conducted by Rupert Lang, honoured the missing and murdered women of the Downtown Eastside of Vancouver and the Highway Of Tears. This thirty minute work has had multiple broadcasts on a number of CBC radio programs. 2005- The Healing Heart Of The First People Of This Land-a commission from revered Lushootseed Elder, Vi Hilbert for The Seattle Symphony; conducted by Maestro Gerard Schwarz. This fifty minute work was a feature part of The Made In America Festival and was performed to a sold out, standing ovation in Benaroya Hall-Seattle. The U.S. television broadcaster PBS is in the process of making a feature documentary on the creation of this work. 1996-EARTHPRAYERS, a massive ninety-minute oratorio that opened the 11th World AIDS Conference in Vancouver. Three hundred of the city’s most accomplished musicians and singers, including the Vancouver Bach Choir, ELEKTRA, Chor Leoni, the Vancouver Symphony, the CBC Radio Orchestra, MET star Judith Forst and Tony Award winner Brent Carver performed this work. Conducted by David Agler. 1987- All Faces– This commission for The Vancouver Chamber Choir and percussionist Salvador Ferreras premiered in the Great Hall in Beijing and was part of the VCC’s historic tour of Mainland China and Hong Kong. Conducted by Jon Washburn-18 mins. 1975-78- Composer/Music Director for the Tamahnous collective. 1975- The University of British Columbia- B.Ed. Secondary . Bruce Ruddell was born in London Ontario in 1951.